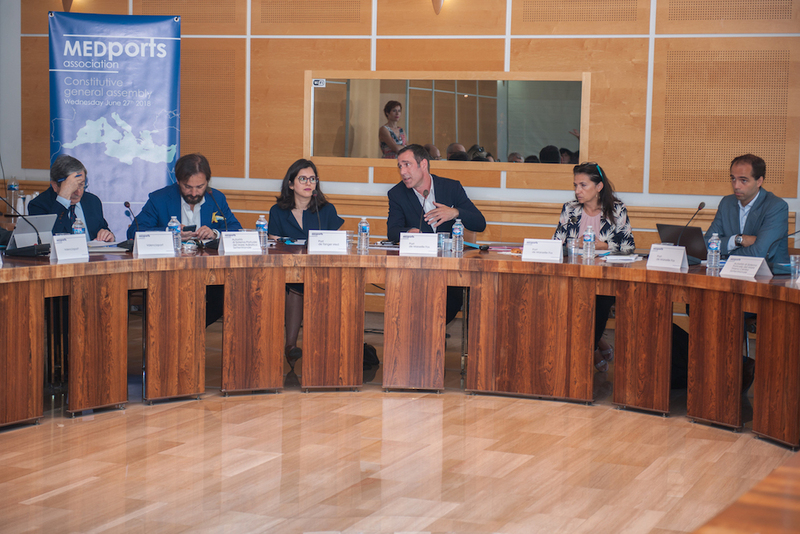 On Wednesday June 27th, the first constitutive general meeting of the MEDPorts association took place in Marseille, gathering approximately twenty port authorities of the Mediterranean region. This initiative, impelled by the port of Marseille-Fos in 2016, materialized the formal establishment of the association. MEDPorts aims to put in place a cooperation area strengthened for the Mediterranean region, under a long-term structure to share the collective ambition to give the ports a better visibility in the worldwide sea transport market. Twenty port authorities attended to this meeting, gathering ports from ten countries from both sides of the Mediterranean sea. The twenty founding members are Algesiras, Arzew, Barcelona, Bastia, Bejaia, Beyrouth, Civitavecchia, Damiette, Luka Koper, Malta Freeport, Marseille Fos, The Office de la Marine Marchande et des Ports (gathering Tunisian ports), Puertos del Estado, Skikda, Tanger Med, Serport (gathering Algerian ports), Tarragone, Toulon, Valence, Venise. They are awaiting confirmation of the Agence Nationale des Ports of Morocco, Alexandria, Durres and Thessaloniki.